The Reverie Eclipse range of Autoclaved Carbon Fibre steering wheelsare available in 4 different diameters; 255, 270, 280 and 315mm. The 270 version is flat-bottomed and can be specified to allow fitment of Farringdon/Stack ST8600 dash systems (not included). 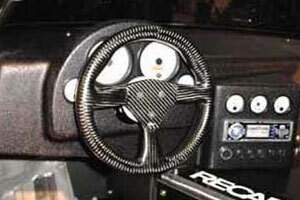 All Eclipse steering wheels are availble with MOMO/Sparco/OMP, Nardi, 3-Stud or Raid drilling patterns. Alternatively, we also make undrilled Eclipse steering wheels or if you require a special drilling pattern, we can accomodate that too. The Eclipse steering wheel weighs from only 215g - a significant weight saving over alternative steering wheels. View our full range of our Eclipse steering wheels. Below, first select which Eclipse model (255, 270 flat-bottomed, 280 or 315) then select desired drilling pattern. If you require a special drilling pattern, please contact us first.